Before I explain this page, I must point out that – All filters ‘work’ to some degree or other, right from stuffing an old pair of tights down the outlet pipe of a pump. But……………………. If you’re looking for a list of items to avoid at all costs when selecting a ready-made filtration system for your pond, then take a look at these enclosed Koi pond filtration systems below. All these and more are on offer today in 2009 and don’t they all look positively shiny, colourful and impressive? Hmmm, exactly what every beautiful garden needs just to add those finishing touches and some will even match your nice wheelie bin! They can even provide the vital biological performance without a single bubble of air! No doubt, all of these units ‘trap’ mechanical debris – they have to because we are pumping dirty water under pressure into these vessels that are stuffed full of various barriers. Just as to how much of this they release to waste during a discharge is a matter for conjecture though – and I mean PURE CONJECTURE! 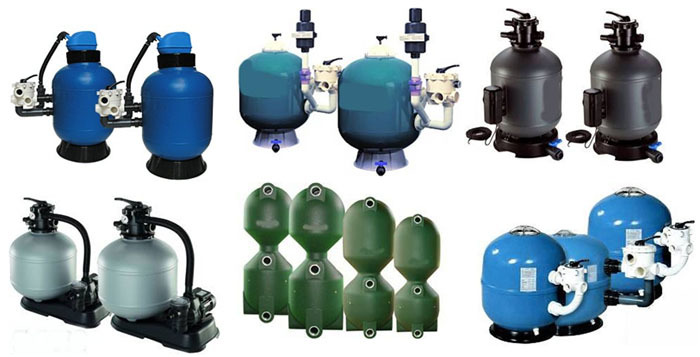 If you are seriously considering the purchase of any enclosed filter units such as sand filters, bead filters, bubble bead filters and the likes. Before you do so, why not ask the manufacturer if he has an example of any one that has been running for a year or so in a reasonably-stocked Koi pond application. ‘Out of Sight is Out of Mind’! By far the best of these types of pressurised units is made in Japan by the ‘Wakishimizu Company’ who have been producing variations of these models for more years than I care to recall. 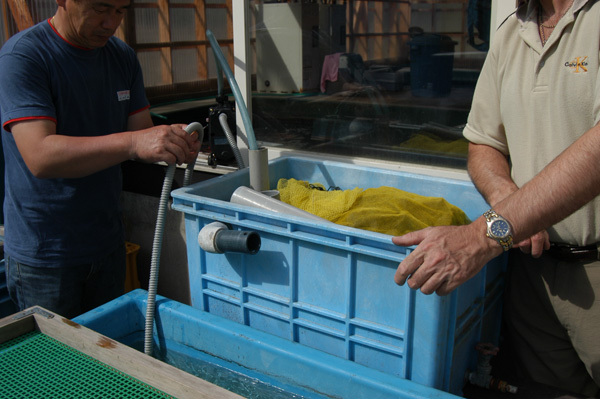 Wakishimizu units seen here in 2004 working on a Japanese Koi breeder’s system for supplementary filtration only. Whilst I have trialled one of these for several years – I still would not part with hard-earned cash in order to buy one. 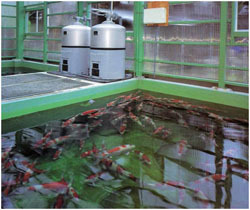 Sanroku Koi farm, Yomogihira village. Here are some more modern-day Mothers of Invention to consider. Prices start at around £85.00 for this next parade of beauties, some complete with a tiny U/V unit and then prices rise ever upwards. Some provide zero filtration, some are mildly efficient but none can ever come even close to the wishful performance claims made by manufacturers. In just about every example, the small and totally inadequate box size completely hides what is really taking place inside. If total cleansing is required (which it is, and always very often,) then the only real way to ensure that this is achieved is to manually strip the box down of all contents, wash them thoroughly and start again, usually with a complete loss of any valuable bacteria. These ‘boxes’ and MANY others are offered for sale on internet-only sites and some ‘specialist’ Koi outlets, some have huge in-store graphics displaying their virtues; others proudly and openly advertise that they are official ‘area distributors’ for these gems and it is rare to be able to attain that ‘status’? when, in truth, it is only another ‘line’ they wish to sell to continue in business. If there was real demand for loaves of bread and baked beans with a Koi on the pack, they would have tons for sale. As to ‘filter boxes’ – they wish you to pick one up from the shelf, pay for it and then take it home – for them, it’s the perfect sale – finished. The next time they wish to see you is when you return to give them more money. Then there’s always the ‘difficult customer’ to bear in mind, the one who dares to ask ‘HOW’ and ‘WHY’ the box works and this does cause a few problems and wastage of precious time – however, if a sale may be possible at the end…..? If this question was asked of the same box at five different outlets and the answers recorded and later studied, it would produce an incredible listing of opposing opinions. One of the sad things is that some retailers actually believe the claims and long words made by the manufacturers whilst others do not care in the slightest as long as a profit is in view at the end. It now reaches a situation where the initial purchase has been made and now ‘add-ons’ are suggested. It is then hard for the buyer to accept that his initial money has been wasted and that he really should throw the nonsense on a skip, then start again. On the other hand, by spending a further mere £xxxx his system may be ‘possible’ perfection? I promise you, it will not be ‘perfection’ nor anywhere near this. The real way of escape here is the skip and cut the losses incurred by putting them down to ‘experience’ – a bitter pill to swallow. All this, and more, can and DOES go on forever because applying a standard box to a non-standard body of water releases the manufacturer of any guarantees at all – there are far too many ways that these written and verbal statements can be reduced to zero in a court of law, all in favour of the innocent manufacturer who is only ‘trying to help the enthusiast’ – and so the story continues. If you wish to know how and why a Porsche works, contact the maker and you will receive full and very detailed information together with the science behind it all, you can then read it at your leisure and then form your own opinions. However, sad to say the ‘science’ behind a Porsche and the ‘science’ behind all ready-made filter boxes for fish ponds are a universe apart from each other. If you need to know how and why one of these filter boxes ‘work’ there is no-one really to pose these questions to because, in truth, no-one involved in making and selling these boxes can give any give valid and clear reasons at all. This is because they do not know exactly ‘how’ they work – simply because they do not ‘work’ anywhere remotely near the degrees professed………….nonetheless, as stated at the very beginning of this page………..they do ‘work’ ………….and if they ‘work’ …………..they are thus a ‘filter’ – problem solved! Is Waddy angry about all this? – Yes, he is, very angry indeed but no more angry than the days of old. The so-called ‘specialist’ Filter Manufacturers of today and those who sell and recommend them are no more than the Garden Centres were in days of old – in fact they are identical in EVERY way, more-so in the case of Black Box bull**** because their boxes, whilst being a slight improvement only on the original disaster, can now command prices that are over twenty times more than the box they all openly mock and denigrate. Despite the fact that, today they advertise to us all that they are true ‘specialist’s in Koi and pond filtration technology’ and go on to embed this into the brains of unsuspecting targets by way of new names and costly graphics – they are no better than the garden centres of old that gushed forth with endless claptrap, thankfully, the serious Koi enthusiasts of the day soon ‘sussed it all out’ in a flash. As long as these enthusiasts remain, there will be a demand for ‘proper’ filtration on a Koi pond. Of course the ‘specialist Koi magazines’ with all their many repetitive ‘Our first concern is to serve our readership’ nonsense, will continue to shout the praises of these illustrious boxes to all who care to read and look. That is, just as long as the manufacturer in question continues to give them substantial advertising revenue. After the end of the particular honeymoon in question, that particular name will be lost forever in their publications. However, all is not lost really ‘forever’, because just as soon as the same manufacturer comes back and crosses their eager palms with silver, their once-shunned product will return to be re-instated as yet another ‘Greatest Box of All-Time’ within their ‘Specialist Koi Publications’. It may also be worth a thought as to whether these box manufacturers actually ‘Keep Koi’? It’s not unreasonable to ask is it? I don’t just mean ‘a few’ Koi – how about a few thousands? That’s when a box can be put through its paces and tested thoroughly before offering it for sale! I would never advise the use of any of these units for serious Koi pond filtration applications.